On Saturday, March 21, the distinguished men of Epsilon Theta Lambda Chapter of Alpha Phi Alpha Fraternity, Inc., held their 15th annual Black and Gold Ball at the Fairmont Southampton Princess Hotel. 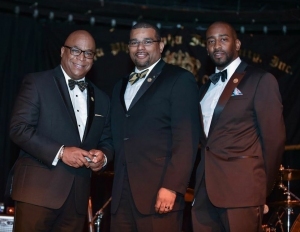 [PRESS RELEASE] On Saturday, March 21, the distinguished men of Epsilon Theta Lambda Chapter of Alpha Phi Alpha Fraternity, Inc., held their 15th annual Black and Gold Ball at the Fairmont Southampton Princess Hotel. This Gala has become a staple on Bermuda’s social calendar with many Governmental Parliamentarians, members of the clergy, members of the Judiciary, and captains of industry in attendance. The Black and Gold Ball was a culmination of Alpha Week 2015, which saw the Alphas host the Symposium at the Bermuda College and the Leadership Breakfast for high school male seniors at the St. Paul’s Centennial Hall. To jump start the night’s entertainment the audience was blessed with a powerful rendition of “Glory” the feature track from the movie Selma by Alpha men, Lloyd Holder (singing) and Chris Crumpler (rap) with background vocals by other local men of Alpha. This was followed by a video tribute to the Late Brother Vincent Bridgewater and special song by Lauren "Bunni" Easton. It is customary every year for the Chapter to acknowledge community servants for their dedication to Bermuda. This year Patrick Tannock, President of XL Insurance (Bermuda), was recognized for his leadership in the field of insurance in Bermuda and for his mentorship of Bermudians in the field. Achievement awards were also given to Alana Anderson and Cherie Dill for successfully completing their actuarial science designation and for their community service and youth mentorship. The entertainment of the night was recording artist, Samantha Howard from Brooklyn, New York, who mesmerized the audience with her broad repertoire and her diverse vocal range. During one of her sets the crowd was on their feet dancing as she belted out “The Way” by Jill Scott. This was followed by the presidential address by chapter president Phil Trott who reminded the brothers that service must be the hallmark of our commitment to our community. The keynote speaker was Peabody Award winning journalist, Vic Carter, who is the primary news anchor for CBS WJTV in Baltimore, Maryland. His highly motivational speech conveyed the importance to the Men of Alpha the importance of staying committed to their community. He explained that they are like firemen in their community and when called upon they must respond. Introduced to the audience on the evening were the contestants for the upcoming 2015 Beautillion (a high school Rites of Passage Program). The contestants are Zaren Bennett , Bermuda Institute, Tahj Cox, Saltus Grammar School, Marcus Henschke, Berkeley Institute, Dylan Wilson, Cedarbridge Academy, Tariq Brown, Impact Mentoring Academy, David Darrel, Warwick Academy, and Even Mosley of Mount Saint Agnes Academy. Also, introduced on the night were the newest initiates into the Epsilon Theta Lambda Chapter, Gladwin Omar Lodge Jr., Jason Wade, Kian Butterfield and Donavan Ratteray. The evening was capped off by a generous donation of eight plane tickets courtesy of Jet Blue to all the former presidents of the local chapter for their hard work and dedication to the community. The men of Alpha would like to thank our sponsors: ASW Law , Cablevision, XL Ltd., Orbis, BELCO, Digicel, Pink Sand Entertainment, Hunt’s Food & Supplies , Toastmasters International ,COMPU-CAD Training and Services , Mussenden Subir Attorneys , Renaissance Re., Department of Youth & Sport and Jamaican Grill as well as the 350 guest who we had the honor of celebrating with on Saturday night.